Offers benefits against age-related diseases (Alzheimer’s). Combats the oxidative stress responsible for brain ageing. Our product is formulated from centrophenoxine, also known as meclofenoxate. Developed in 1959, this molecule is composed of parachlorophenoxyacetate (PCPA) and dimethylaminoethanol (DMAE). The latter is a naturally-occurring substance that crosses the blood-brain barrier and acts in the brain. In particular, it facilitates the synthesis of neurotransmitters involved in the transmission of nerve impulses. As a result of DMAE’s role, centrophenoxine has been widely studied over the last 40 years. Scientists have identified it as a powerful brain antioxidant, able to combat the oxidative stress responsible for ageing of the brain. Research into centrophenoxine has shown it affects lipofuscin, a metabolic waste product associated with ageing, accumulation of which alters brain cell function and disrupts the transmission of nerve impulses to organs. By preventing the accumulation of lipofuscin, centrophenoxine thus offers benefits for combatting brain ageing and preventing associated diseases such as Alzheimer’s. In addition to these findings, some studies suggest that centrophenoxine helps stimulate brain function. While its precise mechanisms of action are not yet fully understood, it seems it improves the brain’s use of glucose and oxygen. Further studies on these mechanisms are underway and could reveal positive effects on the brain’s capacity for concentration and attention. 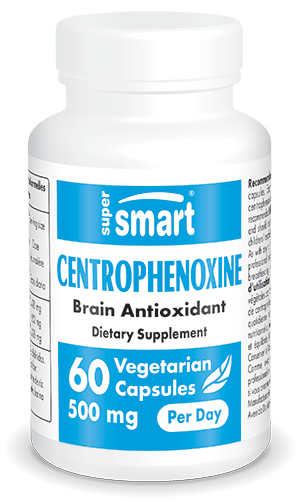 Centrophenoxine thus offers hope in the fight against age-related memory problems, such as those seen in Alzheimer’s disease. Given its inhibitory effect on lipofuscin and antioxidant potency, centrophenoxine has been the subject of considerable research into the prevention and treatment of certain age-related diseases. Centrophenoxine is able to both protect brain cells against the accumulation of liposfuscin and combat oxidative stress by fighting free radical damage. Such effects offer preventive and therapeutic hope for certain age-associated diseases such as Alzheimer’s, which as the leading cause of dementia, has become a major public health issue in recent years. Though its precise cause has yet to be established, Alzheimer’s is characterised by a gradual decline in neurons which results in impaired cognitive function. This primarily manifests in deterioration of memory, language, reasoning and mood. Ageing of the brain is a key risk factor for Alzheimer’s but other factors may also influence its development: family history, diabetes, high blood pressure, lipid disorders and smoking. As there is currently no effective treatment, it is vital to maintain neuronal health in order to prevent the loss of cognitive ability. Designed to combat the oxidative stress responsible for brain ageing, our supplement is offered in the form of ingestible vegetarian capsules, and specially formulated to contain 250mg of centrophenoxine per capsule. It is intended for adults only, with a suggested dose of one to two capsules a day. If in doubt, please consult your therapist. Other ingredients: magnesium oxide, maltodextrin, magnesium stearate. Each vegetarian capsule contains 250 mg centrophenoxine. Adults. Take one or two vegetarian capsules a day, or as advised by your therapist.